About a week ago, the speed skating season came to an end with the world allround championships in Heerenveen. Josh Lose skated in those championships and didn’t skate particularly well, owing to being slightly ill. Despite performing poorly in the regional qualifier, and believing himself to have not qualified, he got a call three days prior to the start of competition, informing him that he had to start. This also happened a few weeks after he had stopped training (because he believed that he had no more races in the season). The week prior to that, most of us were in Moscow for the Junior World Championships. Of course, only two of the skaters in our squad are actually juniors, the rest of us were basically there as “team support” otherwise known as tourists. I had run into some visa trouble prior to departing, the main problem being that I didn’t have one. You see, it ordinarily takes 6 working days to process a Russian visa, but since I had only returned from Canada 6 days previously (and only 4 working days) there was worry that I might not be able to get my visa in time. Add to that, the strange quirk that the Russian consulate was closed on international women’s day, and the fact that it took two hours (and almost 50 euros) each way for me to get there by train, I really only had two working days to play with. Luckily, everything worked out and I was able to travel to Moscow as a tourist team leader for Australia (and Sophie also tagged along, as the team’s medical person). Touristing around Moscow was an interesting experience. Traveling is something that I do quite often but it is very rare that I get to experience a place that is as “foreign” as Moscow city is. First, there was the language. 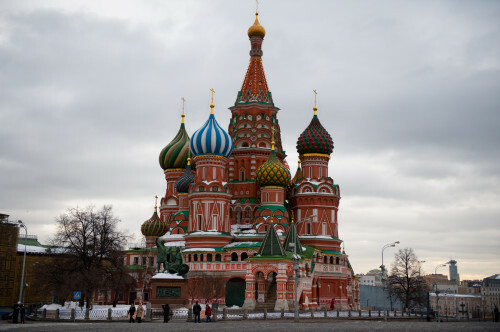 Prior to arriving in Moscow, I did not know any of the letters of the Cyrillic alphabet that weren’t obviously the same as those from the Latin alphabet. On the evening we arrived, I grabbed a few tourist maps of the city and began trying to teach myself the alphabet, if only to enable me to recognize train stations. By then end of our four-day trip, I was able to read Cyrillic (although not very quickly, and not with any understanding of what the words actually meant, though most were guessable). Trains in Moscow are pretty special. The Metro is the second most used in the world (behind Tokyo), trains run frequently, and the coverage is good. The stations themselves are magnificent. My darkroom website features a stitched panoramic shot of the Komsomolskaya station to give you an example of just how wonderful these places are. We had a good day and a half of dedicated touristing during which we saw a lot of the city. We began with a bus tour just to get an initial familiarization with the sights and layout of the city. As it was low season (apparently, everyone comes in the summer time and not in the middle of winter) the bus was empty save for us, so even though we arrived late, and in the wrong location, the bus actually came around to pick us up. After the bus tour, we went walking and did a bit of museum-hopping as well as visiting Lenin’s tomb. Lenin’s tomb is an interesting sight because, despite dying in 1924, his body has been preserved (quite well, if slightly discoloured) in a tomb where anyone can come and visit. Not only is Russian architecture very different to anything that I’m used to (a constant reminder that I’m in a foreign city) Russian history itself lends a strange backdrop to the experience of modern Moscow. In many ways, Moscow reminded me of Beijing, and the parallels don’t stop at comparisons of communist regimes. Both China and Russia experienced long histories of very powerful dynastic empires, “glory days” if you will, during which the respective countries were dominant world powers. Then the empires fell into decline, exacerbated by war, and were eventually overthrown. Now they are both growing and struggling with their image and identity in the world. Here is a link to some of the photos from the trip. Junior world championships went well, with a few Australian records falling (not just junior records either). We all seemed to enjoy ourselves and are very hopeful for the future of Australian speed skating. And now we come to the reason for the name of this blog entry – the future of Australian speed skating will most likely not include me. Obviously I will continue to skate (because I really enjoy it) but intense training and high-level competition are not for me anymore. I am also getting older, and my body is becoming less-suited to sports like speed skating, and more-suited to sports like curling, which I intend to take up. I also hope to continue my academic career a bit, and eventually get a job and save the world (though not necessarily in that order). Do not be alarmed – this is not the penultimate post of the website, but it is the penultimate post concerning speed skating. Why penultimate? Because I expect to have one more. Some of you may be aware already, but I’m currently in the process of shooting and then putting together a documentary about the journey of the Australian speed skating team from about October 2008 until now. This is a difficult process because, apart from all of the shooting that has to be done and interviews (all on a super tight budget), I will soon have to hit the editing suites and begin editing video and sound until this documentary feature comes together. Hopefully it will be of high enough quality to do justice to the extraordinary story of this group of skaters. If anyone out there knows anything about documentary film making or would like to help out, I would really appreciate any assistance (I’ve never done this before). Eventually I’d like to hit a few film festivals and then get this doco shown on Australian and Dutch TV, and maybe a few other countries depending on how successful it is. Hopefully I can get this all done before the next Olympic Games in Сочи (Sochi). And finally, possibly the last Yeow News Network update to primarily feature speed skating. (This one is of a slightly comical nature) Enjoy! Your accent is really distracting. Ever thought of joining forces with Melbourne boy Julian Assange over at Wikileaks? You have some things in common, like activism, journalism and mathematics (he too is a unimelb math alumni, albeit a dropout).